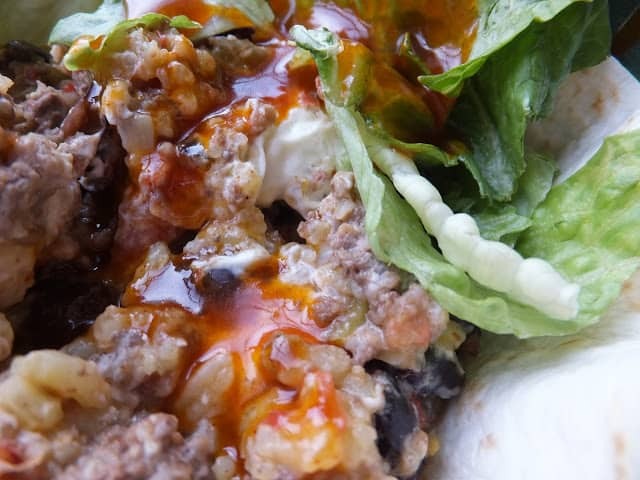 What could be more fun than to serve taco salad in a baked, crispy tortilla bowl? Maybe ice cream but that’s a different recipe and post altogether. If it’s Taco Tuesday at your house tonight, why not consider serving individual taco salads in baked tortilla bowls. Sounds like a plan to me! Making baked tortilla bowls at home couldn’t get much easier. If you have Pyrex glass bowls, preferably 2 to 4 cup size bowls, (or any oven-proof bowls) non-stick cooking spray, and aluminum foil, you can make tortilla bowls at home. You can use one of those special tortilla bowl makers, if you have one but if you don’t, use a bowl or any thing else that’s oven-proof. For this recipe we used ground beef but ground turkey would work nicely too. 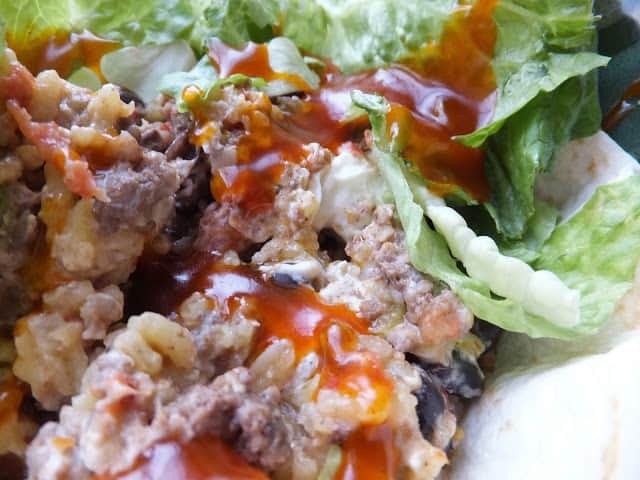 Canned black beans, salsa, taco seasoning mix chopped tomatoes with green chilies, cooked Spanish rice and cream cheese is simmered together to make a super filling for the tortilla bowls. Add then usual taco ingredients and you’re good to go. Keep in mind that the burrito style or jumbo style tortilla shells work the best. Once you start making these super easy tortilla bowls at home, you’ll be amazed at what you can fill them with. A delicious and fun way to eat a taco. Brown ground beef or turkey in a large skillet over medium heat, drain off fat. Stir in drained and rinsed black beans, salsa, taco seasoning mix, water and diced tomatoes with green chilies. Bring to a boil, reduce heat and simmer 10 to 15 minutes. Stir in cooked rice and cream cheese. Cook until bubbly, 15 minutes longer. Spray inside of bowls and both sides of tortillas generously with cooking spray. Line bowls with tortilla shells. Crumble a medium sheet of aluminum foil and place it inside the tortilla bowls. Place lined bowls on baking sheet with sides. Place in a 375 degree oven and bake until crispy and golden about 10 minutes. Turn shells out onto a wire rack to cool. 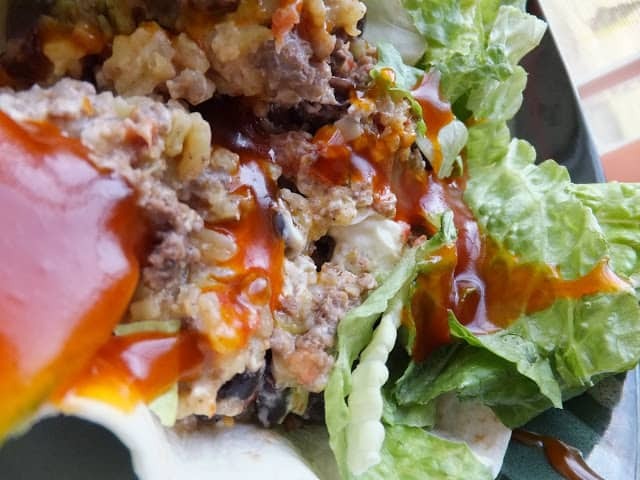 When ready to serve, Place a small amount of lettuce in bottom of baked shell, top with meat mixture, more lettuce, top with shredded cheese and any additional ingredients of your choice. For this recipe we used Ortega Products. Bacon Blueberry Avocado Spinach Salad is another great salad recipe you will want to try. Don’t forget to serve dessert. Why not make a batch of Churro’s and Mexican Hot Chocolate. I love it!! Great find…easy clean up for dinner….eat your bowl, please!! Stopping by from Tuesday's Table – have a great week!! I feel like singing.."Feeling Hot, Hot Hot"!!!Yummy! Thanks for sharing Lynn…I'm going to keep on singing now…FIESTA!!!! lol great meal in a bowl!